SCALE is a first person reality manipulation game that reimagines exploration with a unique resizing mechanic. It's currently on Kickstarter looking for $87K and it's sitting pretty at $41K with plenty of time still left (25 days). Quote Targeting Linux means we’ll be on SteamOS/Steam Machines as well. I expect we will be seeing a lot more of that! You only need to fork out $10 to secure yourself a digital copy of the game as well so it's quite a cheap one. You wield a device that can make any item any size. A tree, a wall, an enemy, a passing cloud, even the levels themselves are all "SCALEable". Space is relative in the game so progress is as much conceptual as it is physical. 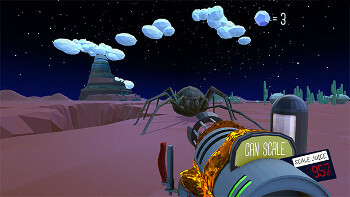 The unique mechanic of SCALEing is inspired by games like Portal and The Swapper. Progression through the game is freeform and open like Mario 64 or early Zelda overworlds. It’s all about exploring and discovering secrets! Easily one of the most promising game Kickstarters I've ever seen. I got to say this description doesn't do the game justice. You need to see the video. This is totally awesome, one of the best projects I´ve ever seen on Kickstarter and it has very beautiful graphics! Thanks for pointing this one out. I backed it and plan to forget about it, should make a fine surprise gift next december. Somebody needs to bring this to gaming night at my favorite convention, SCALE!